Fielders SlimFlor® utilises Fielders SlimDek 210® flooring profile in conjunction with Asymmetric Steel Beam Sections (ASB) to provide a floor system with a reduced construction zone. It does this by combining the floor slab and supporting structure in the same plane, providing a lightweight, versatile, long spanning floor system. Reduced construction time (saving in labour, early tenancy and associated works, approximately 20% quicker floor-to-floor construction time). Minimal temporary propping allows for fit out of lower floors while upper floors are being constructed. Shallow floor depths, reduced overall building height offers savings in façade costs and building height restrictions. Reduced trades onsite (OH&S savings). 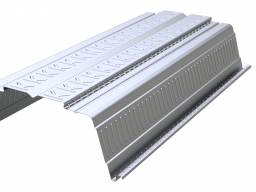 Light weight structure, reducing sizes of substructure and footings. Ease of service integration, with potential to accommodate the services within the slab depth. Inherent fire resistance. A fire resistance of 60 minutes can be achieved without fire protection.